How GISS Temperatures Are Diverging From RSS | Watts Up With That? By Paul Homewood A guest post earlier today by David Dohbro, comparing satellite and surface temperature datasets, appears to have attracted a certain amount of criticism, not least because it has tried to compare anomalies based on different baselines. This is an update to that analysis. To get around this issue, I am posting a comparison of GISS surface temperatures and RSS satellite numbers, both based on a baseline of 1979-98, which is the one used by RSS. (GISS still use 1951-80). This change of baseline means that all GISS temperatures anomalies are reduced by 0.28C. 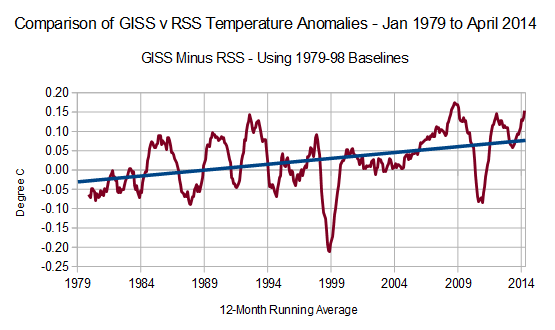 The graph below shows the GISS minus RSS temperature anomalies from January 1979, the start of the satellite record, to April 2014. I have not shown individual months, as monthly variations can be quite large, and would simply serve to muddy the waters. Instead, I have shown the 12-Month average of the differences. There are some marked ups and downs in the record up to about 1995. This may be due to early inaccuracies in the satellite dataset, though this would be pure speculation on my part. 1) During the major El Ninos of 1998 and 2010, RSS temperatures spike to higher levels than GISS. In other words, GISS minus RSS goes negative. 2) There was a period of a few years after 1998, when the two datasets ran closely together. 3) From around 2004, though, there has been a distinct and growing divergence, with GISS showing relatively more warming. 4) Over the full period, as the graph shows, there is a trend is towards greater warming on GISS. In other words, GISS are currently showing 0.20C more warming than RSS. This is a significant number, being nearly half of the observed warming, as measured against the 1979-98 average. The purpose of this post is not to point the finger, and say that one or the other dataset is wrong. Nevertheless, I believe that the differences observed raise serious questions about the accuracy of our global temperature measurements. May 19, 2014 in Climate News. What ever happened to UAH? I thought it was the satellite record of choice for folks here, given that Christy and Spencer created it? What Zeke said. UAH follows the surface measures. It is RSS that diverges. Paul – thanks for the post! Great analyses. You wrote [Quote] “The purpose of this post is not to point the finger, and say that one or the other dataset is wrong. Nevertheless, I believe that the differences observed raise serious questions about the accuracy of our global temperature measurements.” [unQuote]. That is EXACTLY what I tried to accomplish with my analyses as well. I am not finger pointing, just raising questions. As I wrote in my essay “One can write a long essay about all the important difference between how each calculates the monthly GSTA, and for sure that is important, [this of course refers to the different base-line temperatures!] but here I simply and only want to compare each data set and see how well (or bad) they match each other. E.g. is one data set consistently reporting higher or lower than the others, are these differences increasing or decreasing over time or not? Etc. I am not assigning any subjective value to these possible differences; I just want to see if there are any differences and if there is a trend in these differences.” That was all, and is all. Follow up posts like yours were my intent so we start to think about these different data sets and what they report and how the data discrepancies may differ (more) over time. However, and in addition, your work using similar base-lines finds the same pattern as my work: increasing difference over time in reported GSTA between (a) land-based and (a) satellite-based data set. That’s all there is to it, and that’s all we need to know, and warrants attention. I’m really glad to see a discussion of temperature measurement errors. We should all remember that each temperature measurement, satellite or ground, has some error. To measure air temperature to 0.2 degrees C takes a very good and very expensive thermometer and enclosure and a very good location. If one has a large number of good thermometers and averages them, the accuracy improves somewhat, but never to perfection. And, lets face it, this whole debate is over temperature anomalies that are larger than the error of any thermometer made prior to 1900. I own a $400 Omega platinum resistance thermometer and I have routinely measured a 0.5 degree F (0.28 deg. C) temperature difference (in the shade, in a louvered container) between my front yard and back yard with it. The error, day or night, is never less than 0.1 deg. C. So even with the best equipment, short distances matter. I wonder if this whole debate is useless because of the small differences we are arguing about. The Younger Dryas warming dwarfs all of this. The graph at Nick’s Moyhu site also shows that RSS is an outlier–if Paul were to compare UAH (or any other other ground-based systems) to RSS he would see something similar to the GISS-RSS comparison. As Spencer’s page says…”So, why the discrepancy? Well, if it was OUR (UAH) data that was cooling relative to RSS, people would accuse us of being bought off by Exxon-Mobil (I wish!…still waiting for that check..). At least that has been the history of this debate. Paul – just wanted to say that -not surprisingly- using the none-baseline-adjusting the difference between GISS and RSS follows the exact same pattern as what you described both for the monthly data as well as for the 12 month running average data (I can’t post a plot here, so please see: https://www.dropbox.com/s/4c9kovx9n8zsvsv/GISS%20vs%20RSS.pdf). You didn’t provide a trendline (slope). So could you please be so kind to let us know what the the trendline, slope, for the baseline-adjusted data is, so we can compare that with the none-adjusted data. Nonetheless, adjusting the data doesn’t change the fact that the data-bases are increasingly diverging over time, which is what’s important. I dunno Nick, seems like UAH has historically been diverging from GISS as well, at least until recent years. As one of the folks who raised some criticisms of your essay, I would like to extend thanks to you for bringing up the idea of the analysis. I do wish you had been given the opportunity to better complete your own analysis. Perhaps you and Paul can collaborate on future posts to analyze more the differences between the datasets. Jimmy – thanks for the critiques and thanks for your kind words here. Collaboration is always good and I am always open to it. Especially since I have a few other data-analyses on going which are much more data-intense and much more extensive, complicate and I can therefore use all the help I can get! Technically, this is the opposite of what the theory predicts. The lower troposphere is supposed to warm by 1.3 to 1.4 times as fast as the surface. Instead, it is more like 0.5. So, that either indicates surface data tampering or the theory is incorrect. Take your pick Nick and Zeke. II’m totally confused. If you choose the UAH and RSS trends from 1979 (over a third of a century) at WFTs UAH is lower than RSS. What am I missing and please don’t put the boot in too hard. As usual I can’t supply a link at WUWT. In other words there is no difference between RSS and UAH over the period of the analysis because RSS is a bit warmer in the past and a bit cooler in the present. I appreciate skepticism. I even appreciate skepticism of skepticism. But I see little point in being skeptical if the result is to mislead. It is hard to believe this was merely due to ignorance when your claim is refuted in the very link you provided. Bingo! Game, set and match! According the GHG hypothesis, the atmosphere should warm earlier & more than the surface. In reality, just the opposite has been observed. But since the surface “data” have been so stepped on, bent, folded, spindled & mutilated, who knows? And the quote I gave is correct. In other words Nick, UAH diverges from GISS, just not as badly as RSS. Yippee. Unfortunately its not that simple. This [is] well trammelled ground. No clear answers. See discussions at climateaudit and climatedialog. An inquiry. You indicate you have used a 12-month running average. Is this correct? This is a lagging indicating with respect to the time. Is that what you want to show? This is commonly used in stock analysis. When it comes to temp data sets run by activists that want all industrialisation shut down like Hansen does, I get very wary and look for more unbiased sources. I’ll just add what should be an obvious point here…divergence should be minimal considering the fact that temperatures have been flat for about half of the 1979-2014 period. Andy, as I’m sure you know, there are some quite exquisite thermometers, capable of very precise temperature measurements. One of them is the HP quartz crystal thermometer, that can easdily resolve a thousandth of a degree C. Semiconductor (silicon) junction thermometers, can also resolve small increments. A more important question for the silicon thermometers, is the absolute calibration accuracy; an area, where your PRT has a good reputation. But in the end the MOST important consideration is ; just WHAT is it, that has the temperature being displayed on the readout. Is it the thermometer itself, or is it some other physical entity, whose Temperature you want to know. This question is of paramount importance, when that “temperature” reading is something you are trying to control via some feedback loop. Offsets between the system, and the sensor, are a common source of process control errors. Yes, Gavin and the Big Red Dog at CA circa 2008. The theory really isn’t that complicated if you’ve been following the tripe for the last 25-30 years. That sure sounds like Clifford the Big Red Dog. Maybe they’ve “moved on”. Paul Homewood – Thanks for taking note of the comments and doing the update. You have used 12-month averages this time, which makes the graph much easier to interpret, but it may be worth noting that you couldn’t have used monthly figures anyway: In the re-basing, “all GISS temperatures anomalies are reduced by 0.28C“. Once you do this, you can no longer use monthly figures because in the original basing calendar months are based separately. ie, you have re-based the GISS annual average, but you have not re-based the monthly data. That’s not a criticism (what you have done is valid), just a comment. Bill, I’m having a hard time swallowing that theory. #1 Incoming solar energy is absorbed by atmosphere, including GHGs, thereby warming the atmosphere. #2 Incoming solar energy (most of it), that is NOT absorbed by the atmosphere, gets absorbed by the surface, thereby warming the surface. As an aside, some of the surface impinging solar energy is reflected, and some of that is absorbed by the atmosphere on the way out. That too is a portion of #1. #1 and #2 consist entirely of short wave (0.1 to 4.0 microns) solar spectrum energy. #3 Is surface emitted LWIR thermal radiation, that gets absorbed by the atmosphere; mostly by GHG, thereby warming the atmosphere. #4 Is atmospheric emitted thermal and molecular LWIR radiation emitted by the atmosphere including GHG, that returns to the surface , and is partially absorbed, thereby warming the surface. #3 and #4 are LWIR emissions in the 5-80 micron range, and include absorption and emission from clouds. Same consideration applies to #3 and #4; specific heats and other factors determine Temperature rise in both cases. Apparently, you say the data shows that the surface warms more than the atmosphere. That would have been my gut feel choice; but I’m curious as to what theory claims the opposite. I plotted UAH versus GIS a couple of years ago. In the early years of UAH, GISS used to take excursions well below UAH: http://shpud.com/weather/main.php?g2_itemId=88 In recent years (plotted to 2011), GISS takes some big excursions above UAH: http://shpud.com/weather/main.php?g2_itemId=86 Basically GISS appears to exaggerate warming in some very warm spring and summer months. Otherwise it is not as far off. Definitely related to the weather. The waters are muddy, extremely muddy. Let me repeat this. Comparing UAH and RSS to what models have is not a simple affair. Well yes you can make it simple, but when you do you have to make a large number of assumptions. see steven Sherwood for a frank assessment. Clarity may come in October, when Planck researchers plan to release their polarization data. If Planck shows that the foreground is small and the BICEP signal is real, then the BICEP team should still get credit for the discovery, says Marc Kamionkowski, a cosmologist at Johns Hopkins. But David Spergel, a cosmologist at Princeton, says that in that case, the Planck team alone should get the credit. I never said you gave the incorrect quote. What you actually did was truncate the quote so that it did not refute your assertion. The full quote refutes your assertion. I don’t understand your logic here. I suggested you were being disingenuous and your response is to throw up a misdirection. Utterly astonishing. Adding to what George E Smith says, the specific heat of the atmosphere is about 200 times that of the Earth, depends on the humidity. The dynamic part of the climate changing heat, potential energy, to kinetic energy or wind speed, happens in the atmosphere. The oceans heat much slower and move heat much slower. 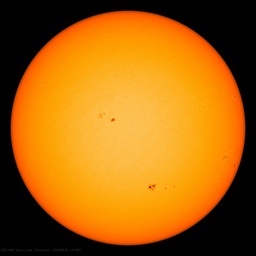 About 17 percent of the Sun’s energy is absorbed in the atmosphere where it produces much greater temperature changes than heat absorbed by the Earth. Temperature is measured about 4 feet from the surface of the Earth and it is measured as air temperature. The measurement is a mixture of the surface temperature and the air temperature. The reading depends on how well heat from the Earth is mixing with the atmosphere that particular day. When we have seasons of higher average wind the temperatures should be closer together. Lower wind speeds should cause the temperature to follow the temperature of the atmosphere to a greater extent. Lord Monckton read that last one. Zeke’s point stands. RSS is diverging from GISS. Why nothing about what else it is diverging from? Mosher, Zeke and Stokes: John Christy, Fred Singer and Richard Lindzen explained it easy enough that even I can understand the “theory”. It doesn’t seem that complicated. Please clear up their misunderstanding. Nick Stokes, did you ever find out if the Great Lakes record ice is correlated to temperature? Since you asserted that RSS was diverging from UAH and therefore implied the 30+ year trend analysis done above was misleading, how can you claim what you omitted was not “significant” ? Your original assertion cannot be due to ignorance as you are now standing by your assertion even in the face of a direction contradiction of your assertion. – I’m sure other sources say other things. But I’m addressing how the link you posted contradicted your claim. – RSS diverges moderately from UAH at the beginning of the record and at the end of the record. This is irrelevant if over the total time period of the above analysis, there is no significant divergence. OK fine. They’re both diverging from the models. Wanna talk about that instead? Sherwood eh? Yes, I’ve read about him. No they don’t want to talk about models. You see, they are “complicated”. Now I know weather is not climate, but to the average man or woman on the street, if we have a few more winters east of the Rockies like this 2013-2014, then they won’t care about any 0.2 C discrepancies between sat and ground obs. And thats the beauty of climate, the AGWarmists may fiddle with what to the layman is an esoteric dataset, but when alarmist hurricane forecasts bust year after year and record cold winters keep rolling in, the Climate Change meme based on CO2 induced warming is dead. To quote the Bard, much ado about nothing (much). No record is perfect. The world temp actually varies by tens of degrees from the equator to the poles. And that varies seasonally by tens of degrees. Yet here you quibble about averaged tenths discrepancies over decades despite natural variability. Angels on pinheads. OTOH, tropical troposphere hot spot was/is a robust feature of CMIP3 and CMIP5 models. And neither radiosondes nor satellites can find it. Model bust independent of absurd precision claims. They were only off by about 400%. Note the Marlboro ad. Back then Big Tobacco only financed real science we could believe in. All the quotes I gave are from that link, an article by Roy Spencer titled: “On the Divergence Between the UAH and RSS Global Temperature Records“.. The trend you quote was from a plot which ended in June 2011. The divergence since then has been considerable. So the best you could think up was the link you gave can’t be trusted because it’s out of date. If so, why post it at all? As you can see using a simple eye ball test, RSS runs warmer for most of this period. (One exception is a few months around Dec ’12 into ’13.) Do you just sort of make stuff up as you go along? …and here’s the whole satellite record. Yes, RSS appears to be cooling versus UAH since the 1998 super el nino. That’s one way to look at it. One could as easily say they’re converging and conclude and that the recent RSS adjustments are bringing temps more in line with UAH. See how easy it is to spin this stuff any way you want? But ooops, they’re both diverging from GISS and HadCrut which are wandering off on their own. And the whole mess of them are diverging even more from the models themselves, the divergence being now so great that even the IPCC is quietly admitting that there is something amiss with them. Why not throw in some tree rings too? They’ve diverged completely from UAH, and RSS and HadCrut and GISS and the models since the 1950’s. Thanks for the good work. Interesting. This just gets dumb. After all the fuss of the predecessor of this plot, you’ve shown a plot of RSS vs UAH with dikfferent baselines. Well, at least you’ve adjusted the baselines. But your numbers are different from WFT. Using the WFT numbers you get this. Makes quite a difference. WFT gives the same plot on their basis notes page. In order to compare recent divergence, I matched the earliest part of each series, Nick. In my humble opinion, the whole point of the post of David Dohbro was the comparison based on land data. This shift towards global data misses the mark. Now, this sort of discussion is why I started reading this site in the first place. I make not pretenses of being a mathematician, so I value greatly the input of people who have these technical skills. Same with the recent discussion about why Goddard’s recent graph and statements needed “correcting” (to be polite about it). A blind man could see that something funny was going on, but without the work of some of the people with valuable experience in the field, I’d never be able to explain to someone exactly what the problem was. So, thanks, and keep it up. We are all victims of this insanity, rolling through a period of benign climate arguing about trivial changes. I for one would like to frac a few thousand gas wells in Africa and improve some lives. vs UAH with dikfferent baselines. Here’s a hint, I wrote “simple eye ball test” for a reason. Although I’m familiar with the game being played here. In order to duck your original deception, you latch onto any irrelevancy you can find and run with that… Oh well. The point is there is an issue with one of the series, which you (and Nick) apparently totally wiffed on. Actually the real issue is “should GISTEMP even agree with UAH or RSS?” They don’t measure the same thing… one measures 1-m temperature the other lower tropospheric temperature. You need a model to decide if the difference matters. Do you have a reliable one? Because if you don’t you can’t make an argument whether the direct comparison is valid or not. It is a bigger issue that UAH is running much “warmer” than RSS, because they are in principle measuring the same thing. The point of aligning on one end is to you can visually compare the slopes (trend comparison). If you align in the middle, you’re comparing the “wiggles” (correlation). The difference between the series is more interesting, though. It does seem like something is going on with RSS. It’d be interesting to compare the trends by zonal (latitudinal) average, but I don’t have time to play with that. <i. "As you can see using a simple eye ball test, RSS runs warmer for most of this period. (One exception is a few months around Dec ’12 into ’13.)" The reason why RSS “runs warmer” is that the different anomaly base raises it by 0.1°C. Get that right, as WFT does, and it looks quite different. If I took your judgmental approach, I would call that misleading. That’s one to take up with the author of this post (I agree). That plot wasn’t aligned anywhere. It showed just two years and said, look, RSS and UAH are about the same. Your plot is similar to Roy Spencer’s, though he has aligned the anomaly bases. And as I quoted above, he does have views on what is going on with RSS. However, the sophistries of e.g. Nick Stokes are enabled by the lack of a definition of GAT. Anybody can change both meaning and emphasis of any statement about a parameter which is whatever somebody wants it to be at any time. And there are two basic understandings of what GAT may be; viz. (ii) GAT is a ‘statistic’; i.e. an indicator derived from physical measurements. These two understandings derive from alternative considerations of the nature of GAT. If the GAT is assumed to be the mean temperature of the volume of air near the Earth’s surface over a period of time, then GAT is a physical parameter indicated by the temperature sensors (i.e. thermometers mostly at weather stations or the microwave sounding units mounted on satellites) that is calculated using the method of mixtures (assuming unity volume, specific heat, density etc.). If the the temperature sensors are each considered to indicate the air temperature at each measurement site and time, then GAT is a statistic that is computed as being an average of the total number of sensor indications. Either of these understandings provides problems. (1) If GAT is considered as a physical parameter that is measured, then the data sets of GAT are functions of their construction. Attributing AGW – or anything else – to a change that is a function of the construction of GAT is inadmissable. Furthermore, the compilers of the data sets each frequently alter their definition – and, therefore, their method of calculation – of GAT. Therefore, the obtained values of GAT cannot be validly compared to anything because it is not known what is being compared. (2) If GAT is considered to be a statistic then it can be computed in several ways to provide a variety of results, each of different use to climatologists. (In such a way, the GAT is similar in nature to a Retail Price Index, which is a statistic that can be computed in different ways to provide a variety of results, each of which has proved useful to economists.) If GAT is considered to be a statistic of this type, then GAT is a form of average. In which case, the word ‘mean’ in ‘mean global temperature’ is a misnomer, because although there are many types of average, a set of measurements can only have one mean. Importantly, if GAT is considered to be an indicative statistic then the differences between the values and trends of the data sets from different teams indicate that the teams are monitoring different climate effects. But if the teams are each monitoring different climate effects then each should provide a unique title for their data set that is indicative of what is being monitored. Also, each team should state explicitly what its data set of GAT purports to be monitoring. In summation, nobody knows what a value of global average temperature (GAT) represents, and what it represents is frequently altered, so it is not possible to validly compare a value of GAT to any other datum. That’s right. The 12 months ending April 14, is shown on the graph at April 14. I realise some people prefer centred averages. So, UAH runs slightly warmer than RSS, but both are currently much colder than GISS. Your numbers are close to the scaling on the plot here. You can see that UAH and RSS are unusually close in April. Over the last year, RSS has been coolest, except in February, and mostly UAH closer to GISS. A cynical person might suspect that the big negative around 1998 was a deliberate effort to avoid the Bob Beamon effect. Can’t have global warming if you’re not breaking records. You’re complaining that we’re not ideological regurgitards? Hi Paul – Excellent post. Any chance you could expand your comment into a full article some time? a climate model, which does not quite match reality. I think both Nick and I agree that the divergence between UAH and RSS is the interesting comparison to make. GISS doesn’t diverge at all from other surface records (NCDC and Hadley) once you account for differences in spatial interpolation methods. Both Berkeley and C&W produce similar (or greater) warming to GISS in recent years because they spatially interpolate their fields globally. There is also the difference between satellite records in and surface records in general, though the cause is much more difficult to determine given that they are measuring different things and are each subject to different potential biases or sources of error. The “what happened to UAH” question was a subtle dig at the tendency of folks to cherrypick the series that shows the results they want to see. Hence the preference of GISS in some quarters, or the switch from showing UAH to showing RSS once RSS started reporting cooler temperatures. Nick wallows in minor math, as if. Surface data are heterogeneous. To understand, we must compare the components. I don’t make mistakes like that Mod; must be the fancy new formatting. Would you be a good chap, and fix that up for me please ? I’m partial to % myself, so I’ll settle for that .